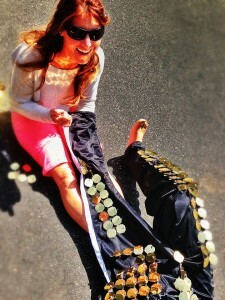 You can’t touch this…. My-my-my-my Durden has done it again. Tasked with designing a billboard to turn heads, Durden looked towards the original rapping hamsters in the Kia commercials for inspiration and were led to another rapper of the human kind. We all remember the 1990’s hit single “U Can’t Touch This,” written, performed, and produced by MC Hammer, himself. This signature song of Hammer’s is possibly one of the most recognizable records ever… which happens to be the same thing Durden wants for Dothan Kia. The 2014 Kia Soul gets 31 mpg on the Highway and costs $13,995. 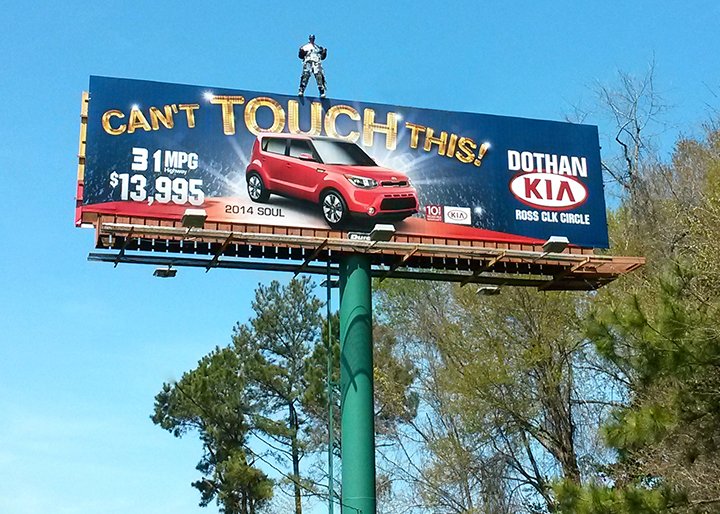 What better way to advertise that then putting MC Hammer on top of a 14’ x 48’ billboard. Well it’s not actually MC Hammer. 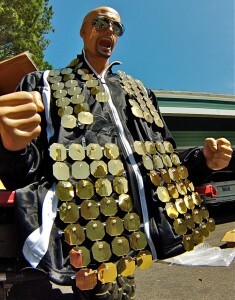 It is a mannequin made to look like him, dressed in a gold & black jumpsuit. 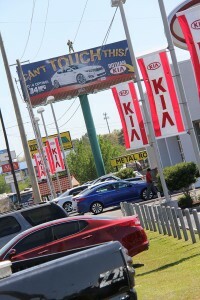 Our Creative Department and Expediting Department worked together with Dothan Kia to create this beautiful 3D Billboard work of art. If you would like #TeamDurden to design your next out-of-home advertisement, please contact our sales department to get started. Nah-na-na-na, Stop, Hammer Time! 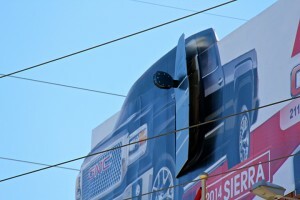 Durden Outdoor Displays, Inc helped Action Buick GMC of Dothan roll out the red carpet for the new 2014 GMC Sierra. The Sierra is a cut above other trucks showcasing the new standard in truck interiors. 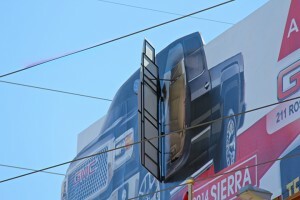 Durden wanted to showcase this aspect of the 2014 Sierra by creating a billboard that entices you to look inside. Sierra’s cabin has been crafted to provide you and your passengers with a quality experience. 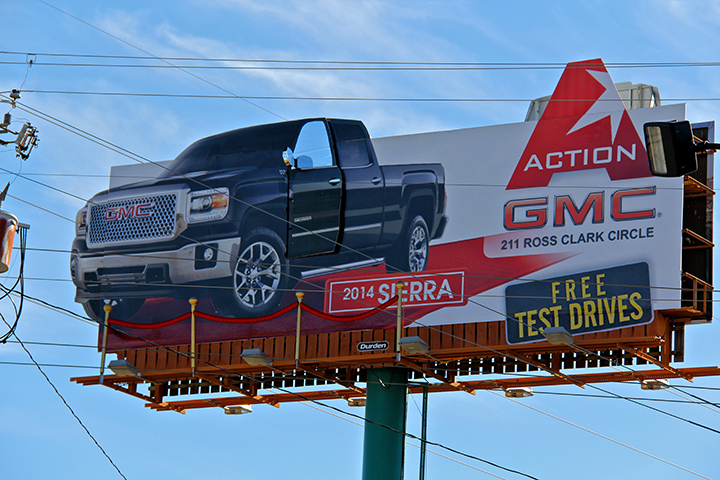 Durden Outdoor and Action of Dothan invite you to open the door to a new Sierra and take her for a FREE test drive. 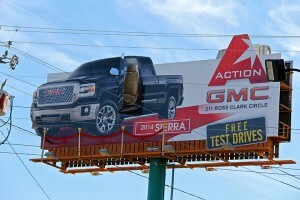 Action of Dothan, located at 211 Ross Clarck Circle, came to Durden when they wanted an out-of-the-box design for their out-of –home advertising. 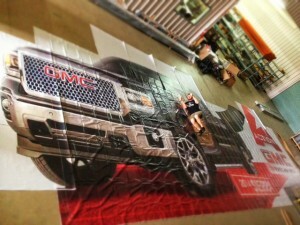 This one-of-a-kind billboard design with a 35’ Sierra 1500 came directly from the Durden Outdoor Creative Department. The 12’ door and 3D Mirror that opens and closes was hand crafted in the Durden Outdoor Production Department. To see the process of creating this motorized truck door for Action, click here. If you would like an out of the box idea (like this one) for you company, contact our sales department today to get started.